"Children are our legacy. They save us from our selfishness, from our materialism. Children are the spiritual messengers that we send to future generations with the Gospel. Children should be viewed from God's perspective not from the world's perspective. The world views them as a burden. The Scripture speaks of them as being a blessing." Hopping over from The Barefoot Mama...that is the sweetest picture ever!!! I love my son more than anything, but I will admit I'm not a blissful mama like so many other seem to be. Good to remind myself that children really are a blessing from God and they are here to teach us stuff too. Hi Brynna! 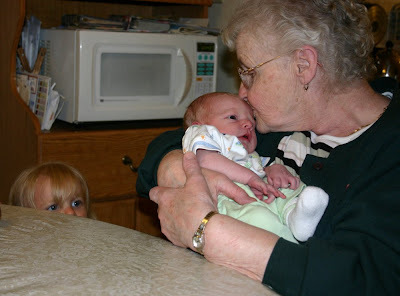 I do love that photo of Chase and his great Grandma too! Mama K, thanks for stopping by and commenting! Having children has caused my patience to grow by leaps and bounds and forced me to live an organized life. Two things I wouldn't have without them! Wonderful quote! So true too. I was just reading on Yahoo news of that woman in Canada who just had her 18th biological child and her husband said they will have as many babies as God gives them. The picture is just precious!